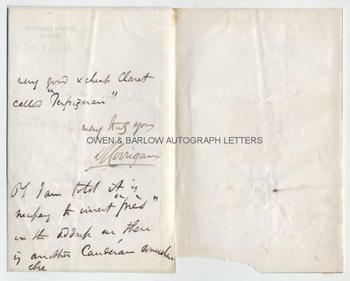 SIR DOMINIC CORRIGAN Autograph Letter Signed. ALS. 2pp and integral blank leaf. 4 Merrion Square West, Dublin. March 2nd 1863. To Sir Bernard [Burke]. 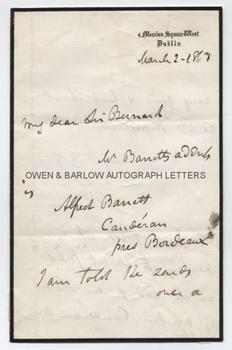 "Mr Barrett's address is Alfred Barrett, Cauderan, pres Bordeaux. I am told he sends over a very good and cheap claret called "Perpignan". Very truly yours, D. Corrigan. P.S. I am told it is necessary to insert "pres" in the address as there is another Cauderan somewhere else." 8vo. Approx 7 x 4.5 inches. Integral blank leaf backed onto paper and with slight loss to lower edge of blank (not affecting the text leaf). Very good. Sir Dominic Corrigan is best known for his pioneering work and research into heart and lung disease. The abnormality "Corrigan's Pulse" is named after him. Armand Trousseau, the French clinician, also proposed that aortic heart disease should be named "Corrigan's disease". Although he was an immensely successful surgeon and was appointed physician-in-ordinary to the Queen in Ireland, Dominic Corrigan was also a tireless worker for the less well-off and did much work to treat the poor during the Irish Potato Famine. He sat briefly as an M.P. for Dublin and campaigned for a better system of education in Ireland and for the release of Fenian prisoners. Perhaps due to his Catholicism, his application to the Royal College of Physicians in Ireland was blocked. Nothing daunted, he sat the College's education exam with the newly qualified doctors. Four years later Dominic Corrigan became president of the College (the first catholic to hold the office) and was re-elected as president on a further four occasions - a record that has never been equalled. Although the recipient of this letter is given only as "Sir Bernard" he can be identified as Sir Bernard Burke (the genealogist, founder and editor of Burke's Peerage), as it is from a cache of letters, all of which were addressed to him. 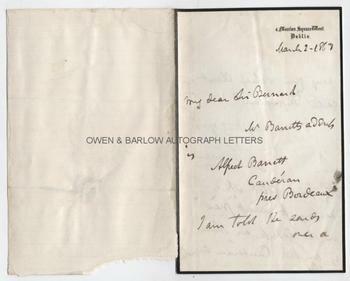 It is interesting that Dominic Corrigan is writing to him, as Corrigan himself was created a baronet in 1866 (3 years after the date of this letter). Sir Bernard had been appointed Ulster King of Arms and Keeper of the State Papers in Ireland. He had taken up residence in Dublin and it can be conjectured that Dominic Corrigan was either his doctor, or the two had become acquainted socially.